Supreme Hanes Tagless Boxer Briefs Underwear Sz S-XL (1 BOXER / PACK) Authentic! Supreme Hanes Tagless Tee BOX LOGO KING OF NEW YORK CUPID (1 T-Shirt) AUTHENTIC! Good condition, a little bit of graphic fade. Length-26". Supreme Nasty Nas Tee T-shirt Size L Black Fall Winter 2017 Box Logo confirmed. Shipped with USPS Priority Mail. Used Supreme Jewels Logo Shirt Size Large. Condition is Pre-owned. Shipped with USPS Priority Mail Flat Rate Envelope. NWOT Men's Supreme x Hanes Checkered T-Shirt Medium. Condition is Pre-owned. Shipped with USPS First Class Package. Supreme Bus On Fire T-shirt Authentic Large. Condition is Pre-owned. Shipped with USPS Priority Mail. 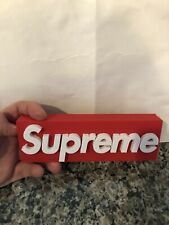 Supreme White T-Shirt Tee Classic Box Logo Red White Black Grey Color. Shipped with USPS First Class Package. 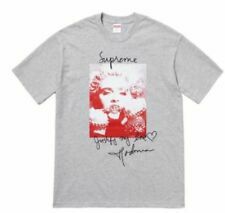 Supreme Gray Riders Tee T-Shirt Size M Deadstock. Condition is New with tags. Shipped with USPS First Class Package. 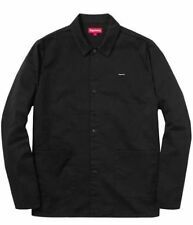 Supreme Bloom Long Sleeve T Shirt black Size L. Condition is Pre-owned. supreme joggers. Shipped with USPS Priority Mail. Supreme Ladybug Tee - Red Size Extra Large 7/10 condition - worn ~5 times, washed 2 times, never dried. Fabric on the edge of the left sleeve is sort of pulled, see picture. Came like that from Supreme unfortunately. Check out my other listings, thanks! rubber johny tee supreme size large. Condition is Pre-owned. 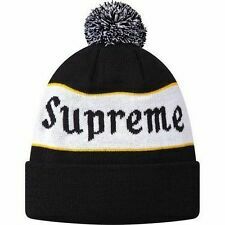 The Supreme Clothing line features a variety of fashion items that can be worn for different occasions. The options include shirts, jeans, and athletic accessories. These pieces are manufactured in various sizes to accommodate different body types. What are the shirt options? Supreme tees are made in many bold colors. Some clothing items have a graphic image on the front and/or back, and often, the main color of the tee will match the elements that are featured in the image. Simple solid white cotton T-shirts are also available. All T-shirts by Supreme are manufactured using a professional-grade cotton that is designed to provide efficient air circulation. What are the Supreme pants options? Jeans and other pants from Supreme are stitched in a unique way so that the material can provide support, protection, and comfort.Sweatpants by this brand usually feature some sort of design element. Traditional sweatpants are designed using one color scheme; however, a few pieces may have multiple colors that are scattered on the plush material. What are the Supreme seasonal and sporty options? You'll find many long-sleeve shirts and thick hoodies in the seasonal product line of this fashion brand. The long-sleeve products are meant to be practical pieces for windy weather and are constructed out of insulated fabric. Hooded pieces are meant to also boost comfort, with a thick hood meant to resist shifting in high winds. Many pieces are made from materials that are designed to withstand heavy rain.Also available are jerseys from Supreme Clothing designed with various graphics of different NBA teams. What are the material and hardware options? 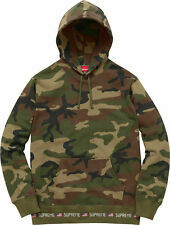 Many Supreme designer jackets for men are made with a military pattern that matches colors that tactical teams use to blend in with the surroundings. Pieces that are designed for winter weather will have cotton or fleece fabrics. Many long-sleeve fleeces are designed with buttons that run up the center of the material near the collar.Thick jackets that are made for heavy wind have puffy material that's lightweight. Because the outer layer of the puffy fabric is coated with a unique protective substance, water can't damage the jacket. Most puffy jackets have adjustable features that are designed with Velcro, spacious pockets, and convenient zippers.Rain coats by Supreme are designed with a hood and long sleeves. Since these clothing pieces are made with windbreaker fabric, they're practical options for light wind and rainstorms. Content provided for informational purposes only. 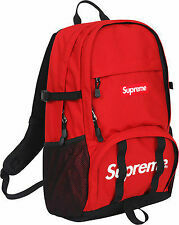 eBay is not affiliated with or endorsed by Supreme.